Guardians of Order staff writer and GURPS freelancer David Pulver discusses his current projects, including the newly-released anime horror RPG DEMON CITY SHINJUKU, his ongoing work on TENCHI MUYO! The RPG, and his two current projects for GURPS Traveller. Steffan, the author of FUDGE, and Ann, whose company Grey Ghost Games publishes FUDGE products, discuss anything FUDGE. Bob Portnell takes questions on SIMPLY ROLEPLAYING! from MicroTactix Games, his super-hero gaming column at Comic Book Life, and the joys and trials of line editorship. The fnords ate this illuminator. Who says that the text adventure is dead? Check out the Old Testament Text Adventure. Or, for a really SHORT experience, try the Richard Cory Text Adventure. Or "Corey," as the case may be; the authors can't make up their minds. You will want to give the art at the end of the game a miss; subtle, it's not. But the text game is definitely worth the very small investment of time . . . When they're all out to get you, your day can fill up fast: changing buses, dodging metal detectors, renting P.O. boxes. Now, for the theorist on the go, intricate plots - all of them - come in this quick, easy-to-digest article from Brunching Shuttlecocks. I'm in the Windy City from today until Monday, meeting with Alain and Micah to scheme about new games in general and In Nomine in particular, visiting FASA and Bungie, discussing plans for a new [NOT AVAILABLE AT YOUR CLEARANCE], and generally hanging out with our Chicagoid MIBs. I'll report further when I get back. I will also be doing three game store appearances, along with our Managing Editor, Alain Dawson. There will be demos, prizes and book signings. All you Chicagolanders, shake off that cabin fever and come out to play! On Friday, January 28, we'll be at AF Books in Frankfort, Illinois, from 9:00-11:00 pm. For directions or information, please call (815) 469-5092. On Saturday, January 29, we will visit Games Plus in Mt. Prospect, Illinois from 12:00-2:00 pm. For directions or information, please call (847) 577-9656, or check out their Web page. Later that day, from 4:00-6:00 pm, we'll be at Something Wicked (the mystery/game store) in Evanston, Illinois. For directions or information, please call (847) 328-1300. There are two ways to look at the story of the French math whiz who cracked the code on their "smart" bank cards. Was he an evil hacker trying to blackmail the banks, or was he a brilliant entrepreneur who saw a potential problem, worked to solve it before criminals could figure it out, and then made the mistake of asking to be paid well for his time? On the one hand, he asked for a lot of money to reveal his formula. On the other hand, if his intentions were malicious, he could have wreaked havoc by publishing it on the Net. And it certainly looks as though the "offense" for which he was arrested - buying ten subway tickets with his gimmicked cards - was performed at the request of the bank, after he contacted them! In late February, we'll know what the French courts thought about it . . .
S. John Ross has set up a lot of Dan Smith images as Sparks - downloadable drawings set up as TrueType glyphs. Thus, they can be printed out in any quantity and at any scale. Docco is included . . . No, they're not ALL free, but freeware samples are available on the site. If you think that online bookselling is the cutting edge of the Internet, think again. Those Goats guys have a new business plan . . .
January 23, 2000: Army Men! Fighting Plastic, a game by Corey Butler. Still in playtest; tell him what you think! The Army Men Homepage, with collector/nostalgia information and another set of rules. Java's Crypt now has their own section in Warehouse 23, showing the entire line of Illuminati and In Nomine jewelry. January 21, 2000: Two Million! Sometime Tuesday, we hit the 2,000,000 mark on our home page hit counter. Scary . . . the 1,000,000 mark was only 15 months ago (we've been keeping count since 1996). And of course we have thousands of visitors every day who don't go through the home page; they visit Pyramid or Warehouse 23, or go directly to one of the game pages. Our thanks go to the people who make this possible. We have a number of volunteer editors for various pages. They're the ones who keep the news, errata, and other content up to date. Think good thoughts about them . . . And, of course, none of it would happen without webmaster Kira and assistant webmaster Keith, and the people at IO who keep the the T3s up and running. And, of course, without the fans it would be nothing at all. It's nice having you folks visit. Please keep coming . . . Yesterday's upgrades went fine, though as it turned out the problems were more hardware-related - all of the cooling fans in our server's case had failed. But a bit of minor surgery fixed it right up, and all is well again. Our webservers will be offline for a short time Thursday for some long-overdue upgrades. Don't panic. Everything is under control fnord. January 19, 2000: Is This A Test, Sir? Finally went to see Fight Club last night. Liked it. Much better than the reviews . . . I suspect that the critics liked it too, and didn't want to admit it. You have to sympathize with the protagonist . . . it would be pretty rough to suddenly find out you were the leader of the Servants of Cthulhu, and even rougher to find out you couldn't quit. K. David Ladage sent us this new skin for WinAmp, based on the GURPS cover. Kind of neat . . . I use SoundJam for my Mac, but part of its package is a converter for WinAmp skins, so I've got this on my own machine right now . . .
We're now shipping The Munchkin's Guide to Power Gaming and the French version of Illuminati. And we've just done another print run of the GURPS Basic Set, and we printed another 2,100 hardbacks. Almost all of them have gone to distributors already; yes, once again, it looks like we should have done some more. For the full-scale blurbs for the new stuff, see our New Products page. I will, however, take this opportunity to say that the Munchkin's Guide is an EXTREMELY silly book and, if you like humor about gaming, you should definitely check it out. January 16, 2000: My Brain Hurts! It seems that the folks at Goats came up with a new direction in gaming early last year. How could we have missed it? Steven Brust, author of such excellent books as To Reign In Hell, The Book of Jhereg, and The Sun, The Moon, and The Stars is joining us on the Pyramid chat area next Wednesday to discuss his writing and current projects. Don't miss out - if you're not already a subscriber, join now! Check out conspiracy.com . . . but don't tell them where you found out about it. January 13, 2000: Are We Really This Desperate? Who am I to say? Maybe we all have a Voard in our future. with 20 megabucks . . . Check out the CNN story. Is it real or is it Illuminati? SJ Games and Alliance Games Distribution, Inc., have agreed to an arrangement that will allow the four Alliance warehouses to offer 100% guaranteed fill rates on all SJ Games items in print. Alliance will keep an inventory of all backlist product and monitor the inventory level in order to make sure retailers can always get their orders immediately. Said David Cooke, VP of Alliance, "Starting February 1, Alliance will offer a 100% fill rate guarantee for all Steve Jackson Games items that are currently in print and available." It was the Customs Service rather than the Secret Service, but what happened to Ramsey Electronics in November was eerily like our own experience with the Cyberpunk raid. The perfunctory, incorrect, unsigned inventory list of seized goods is especially familiar . . . as is the story of a clumsy initial "recon" followed up by a raid on a legitimate business, using wholly unnecessary force. Ain't it great to live in a free country? As with the SJ Games raid, it makes you wonder why they didn't just come in and talk to the boss . . .
Visit Slashdot for much more on this. January 9, 2000: There's One Born Every Minute? Product testing above and beyond the call of duty . . . that's what you'll find on the Ultimate Bad Candy pages. Its creators have tried the Candies That Should Not Be Eaten, and lived to tell the tale, that others might avoid their misfortune. Our hats are off to them. January 7, 2000: Curses, Foiled Again, Eh? You wouldn't think from looking at all those benign, smiling faces that Canada could field a cutthroat group of spies, and you'd be right. According to All Things Considered, they've been lax of late, letting little things get in the way of the finer points of international espionage. Faced with widespread criticism, OSHA has explained that no, they didn't really mean their "clarification" to have general application after all, but they are withdrawing it anyway. The story is on CNN.com. But they called for a "national dialogue" to study the issue of government supervision of employees who work at home. I'm still going to write my letters. All right. Here comes our benevolent government again, making it harder for people to earn a living. The Net makes "telecommuting" possible . . . now you're not completely dependent on your local job market, nor do you have to live in a bad place to keep a good job. And it's great for a company like SJ Games, because we can draw talent from all over the world. But the Feds have to get involved . . . These OSHA regulations make employers legally responsible for the employee's HOME, which gives employers a very good reason not to hire telecommuters, or to fire the ones they already have. Here's the whole CNN.com story. If you think this is insane, write to your Congressman. I'm going to. Our telecommuting employees are very valuable, but I sure don't want to have to snoop around their houses every few months, and the government shouldn't force me to do it. 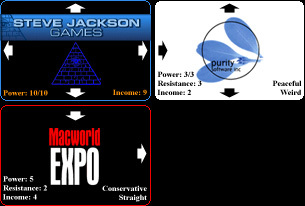 With the recent Illumination of Purity Software, Inc., Steve Jackson Games has launched an ambitious play today. With Purity's added transferrable power, in the form of a WebSiphon version of The Fnorder, the attack is sure to succeed. To join the ranks of the Illuminated, visit Purity Software's booth (#3458, in the North Hall Net Innovators pavilion) at MacWorld Expo today through Saturday and mention the secret word of passage. You don't know the secret word of passage? January 3, 2000: But Bugs Are Natural! As we enter a new century of freedom and scientific progress, Austin-based Whole Foods has given into the latest round of anti-science hysteria and banned "genetically modified" ingredients from its products. Meanwhile, looking at their site, we see that their next featured chat is "January 6th, 6:00-7:00 PDT - Turn those pesky insects into delicious meals! David Gordon is a biologist and author of The Eat-a-Bug Cookbook. Chat with him about the benefits of eating insects." January 2, 2000: Kira Writes a Book! No, not a GURPS book. Actually it's a CGI book for beginners, entitled CGI Programming 101. I've been working on it for longer than I care to think about... 3 years is a conservative guess, though admittedly about half of that was procrastination. The other half was a lot of hard work, since I chose to self-publish, and had to not only write the book, but also do the layout and print buying. But it's finally done now. I had it printed by Bang, the same printer that does many of SJG's books, and it turned out really nice. I doubt it'd have gone so smoothly without the help and advice of a lot of people at SJG: Jack Elmy, who designed the spiffy cover; Gene Seabolt, who showed me how to tame Quark; Monica Stephens and Russell Godwin, who answered a great many of my questions about printing and shipping books; and SJ, who edited the English parts of the book (as opposed to the Perl parts) and who proofed the cover text for me. I also have to thank Mark Cogan, one of our Pyramid subscribers, who proofed the Perl code and helped me refine many of the chapters and code examples. Many thanks to all of yall for helping me turn this crazy dream into reality. If you'd like more info on the book, visit http://www.cgi101.com/class/. The table of contents, ordering info, and first six chapters are online, along with code and examples from the entire book. January 1, 2000: Happy 2000! Looks like we've all made it into the new year, even if the new millennium technically IS next year. The calendar rollover has gone more smoothly than expected by anybody but the most Y2K-complacent. And I am *delighted* that the emergency preparations were unnecessary. Working on GURPS Y2K certainly killed any lingering ideas I might have had about the romance of chaos . . . So now it looks as though we'll start 2000 about where 1999 ended. Which is fine with me. 1999 was a good year for gaming and for SJ Games. Sometime in the next couple of weeks, I'm going to write an "annual report" for you . . . after all, our customers are very important stakeholders in this operation. Oh, and here's MY new year's prediction . . . next year we'll start listening to everybody who said that the real millennium starts in 2001. And we'll do another round of mega-parties!